Use a seed list to ensure a group of addresses receive all sent email campaigns. A seed list is a common way to include specific addresses on all email campaigns that send for an organization. Seed lists are helpful for confirming email deployments and ensuring that key stakeholders are included in an email deployment regardless of the main list being used. A seed list is a single list in your account that will be automatically included on all sent emails. Each organization may assign one seed list for standard campaigns and one seed list for triggered campaigns. One list can be assigned to both types of campaigns. 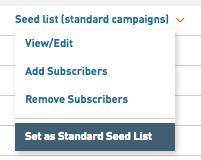 Only lists with less than 100 subscribers can be assigned as a seed list. Only users with Account access can designate seed lists and make modification. Once a seed list is assigned, a green seed icon will appear next to it. Addresses can be added and removed from the seed list at anytime. Addresses on the seed list will only receive the email once, even if they are on the main list and the seed list. The seed list is applied second to the main list; therefore, if an address is on the main list that address will receive that version of the email with any personalization provided from the main list. Seed list addresses will still receive a copy of the email even if the address is on the assigned suppression list. 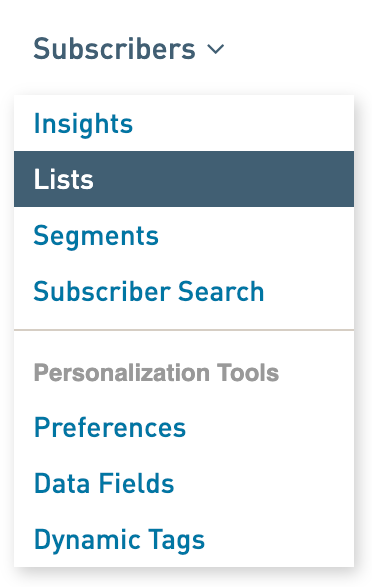 Personalization through list data fields will not be applied to any emails received from the seed list. Subscriber data fields may be included if the seed address has updated data in WordFly for subscriber data. AB campaign sends will deploy both versions of the email to each address on the seed list. Triggered campaigns (CRM integrated accounts) will deploy the email to each address on the seed list every time it sends - unless there are no addresses imported. Seed list addresses are included in your Reporting "Sent to" total. Any email responses (opens, clicks, unsubscribes, bounces) generated by addresses on the seed list will be included in the reporting stats for the sent email campaign. Emails sent to on the seed list will count in monthly totals under the Pay Per Email pricing plan and as active subscribers under the Monthly Subscriber pricing plan. Easily designate or remove a seed list assignment following these steps. Any subscribers imported into this list will be included in all sent email campaigns. Importing new subscribers into this list will add those addresses to the seed list immediately. Be sure to inform your team about the seed list to ensure no accidental imports or deletions occur. 1. Go to Subscriber > Lists. 3. Select one of the options available to import your addresses. You can import your seed addresses as a CSV file import, CRM import or manual copy/paste import. 4. Name your seed list something specific such as "Seed list". 5. Finish importing addresses into your new seed list. 6. [Optional] Assign a Label to your seed list. A label helps to tag this list as a separate list from other lists. Example of a new label could be, "Seed list for all sent emails"
2. Click on the name of your seed list. 3. 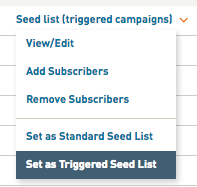 From the list options, select "Set as standard seed list". CRM integrated customers, users will see the standard option as well as "Set as Triggered Seed List". 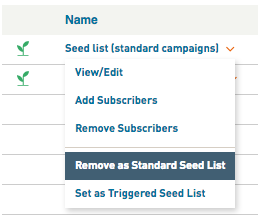 Your list is now designated as a seed list and a seed list icon will appear next to it. You can easily remove a seed list from the list options or delete the list to effectively remove it from being a seed list and being sent to. *Note: If your seed list has over 100 subscribers you may proceed to assign a new list as the seed list, or else use option 2 below to delete the list. 2. Click on the name of the seed list. 3. Select the option "Remove as Standard Seed List" (or "Remove as Triggered Seed List"). 2. Check the box to the right of the seed list. 3. Click the gear icon above the checkbox column. 4. Select Delete from the end of the gear menu.